I think this clock is a rather good example of what happens when customer asks that their clock be brought back to all of its glory. 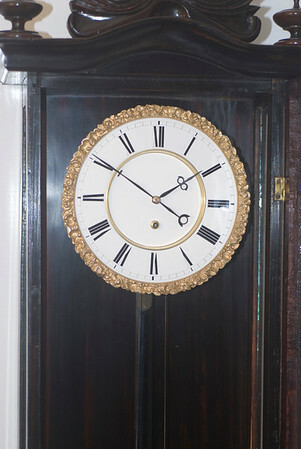 The first picture in the gallery below shows the clock as it was before being cleaned up and having its missing parts replaced. The second picture shows the end product. A very nice, and wonderfully simple late Biedermeier that had lost its headpiece and 4 of its finials. The buyer had enough vision to understand that the clock really was a great gem in the rough, and commissioned us to do what it took to get it back to its glory. I hope you agree that the final product was worth all the effort. The clock itself had its original mechanism, dial, piecrust bezel, wall stabilizers, excellent pendulum bob and rod, wonderful hands, it was a very nice piece, just very dirty, and missing some parts. The mechanism was one of the simply fantastic small timepieces for which the Viennese are justifiably famous.